The Guest House is a 4-bedroom, 4-bathroom house situated between the Lodge and the Glitch House on the expansive site of the retreat at Playa Grande. The building consists of 1,400 square feet of interior space and 1,600 square feet of exterior space, located on the only area on the lush property that is a natural clearing. Slightly removed from the shade of the dense jungle canopy, the building receives plenty of direct sunlight. Taking cues from the existing surrounding landscape, the Guest House is designed around the natural clearing and its two distinct trees. The building is a series of 4 identical mirrored suites unified under a single roof. The suites’ rotating orientations alternate the views of each suite to align with one of the two trees. While the trees provide reference points to align the suites, the center of the clearing serves as the center of the arc of the roof that curves around the edge of the open space. 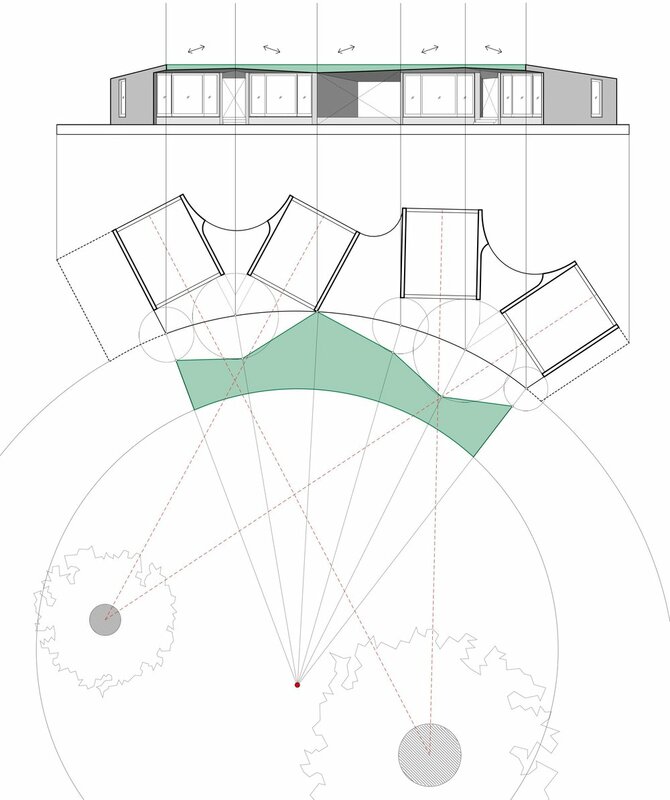 The shaded areas between the rotating suites create shared outdoor spaces for the retreat’s visitors. The Playa Grande Guest House is the result of collaboration with local architect Estudio Sarah Garcia.